Fisker Automotive is the one of several niche automakers trying to make electric (or hybrid-electric) sports cars happen as a product. However, they've noticed that one part of the experience of traditional sports cars is missing - according to an article in Forbes Autos: the electric motor "is completely silent, Fisker says, which might worry pedestrians with bad eyesight and disappoint sports car freaks keen to hear the roar of their machines." Nice of him to list the safety concerns of the handicapped first, but I don't buy it - he's mostly worried that without a suitably intimidating sound, the car won't be as able to supplement its would-be drivers' masculinity. The solution? 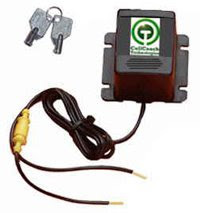 Fake engine sounds, pumped out of electric speakers both inside and outside the vehicle. Asked if it's just a gimmick, Fisker responds that "most car makers already tinker with the sound of the engine." This is true - the exhaust pipe designs are tuned to produce tones that will appeal to drivers - but internal-combustion cars are still using the actual engine to make the sound! Having to resort to canned revving is a whole different beast, and one that's likely to offend those paying a high price for what they expect to be a premium, and genuine, product. It's like fake air intakes on cars - if you can tell it's fake, the credibility of whole product gets dragged down with it. You know, I'm starting to like defunct products from the past. This, along with the flame gun, is the kind of ruthlessly effective (and fun to use!) product that could never be sold now - something about lawsuits, all that stuff. Anyway, with The Anti-Hitch Kink, we're helping out all those poor motorists who are dogged by kids hitching on to their rear bumpers. "A surprising shock" is what they've got comin'! 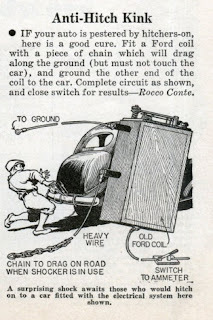 Definitely satisfying for the driver; as for the kid, well, now he's probably laying stunned in the middle of a street... Hmm, wonder why this product isn't around today? 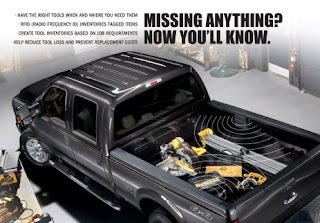 Auto blog Jalopnik reports on a new system to be integrated into Ford trucks used by construction pros - "Work Solutions" involves RFID readers that scan the truck bed for tools affixed with RFID tags. That way, you'll know what's in there - and more importantly, what isn't - so you make sure to leave the job with all the tools you came with. I don't know what the cost/benefit tradeoff is here - the cost of the system versus the cost of losing a tool here and there - but it may very well work out to be a great deal. Can I use the same system for a camping trip or a party weekend...? Monster Cable is the most prominent of several companies that make "premium" cables, mostly for home theaters, which claim to deliver a higher-quality signal from the source to your screen and speakers. However, these performance claims have been generally debunked in objective comparisons, and the real difference between regular and premium cables seems to just be the price. So why do these companies stay in business? The peculiar psychology of the consumer dictates that if something is more expensive, it must be better; and if you believe your products are better, you'll actually enjoy the experience more. So, if a $100 cable makes you feel better about your home theater experience, even if the experience is actually the same, is it worth it? Maybe - it's a small price for the even illusory satisfaction. The same goes for wine (more expensive "tastes" better), luxury cars (brand name means something), and on and on. 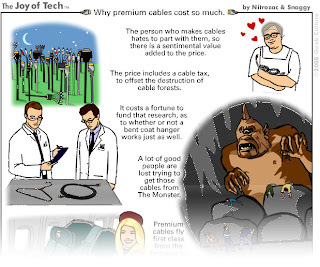 Still, where does Monster Cable get their high pricing from? Check the comic at left from Nitrozac & Snaggy at The Joy of Tech - and click the image to get the rest of the "reasons," I didn't want to steal their thunder! It sounds like bike computers are starting to come of age; previously, they've been able to tell speed, max and min speeds, and distance traveled. 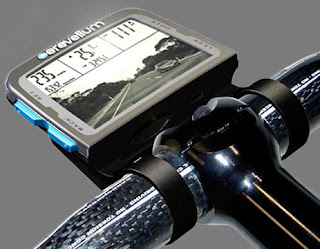 These are all well and good, but the Cerevellum (currently in concept phase and somewhat under wraps) ups the ante with a modular system into which you can plug modules providing GPS, heart rate monitor, energy monitor, and rear-view camera functions. That last one sounds particularly useful for safety purposes - I've never used the little helmet-attached rearview mirrors for cyclists, but this way has gotta be better. An extra function that I'd suggest: the camera recognizes when a car is approaching from behind, and when it's about 30-40 yards back, flashes a bright strobe a few times to remind the car that you're sharing the road. Sure, it won't be cheap, but safety is invaluable! 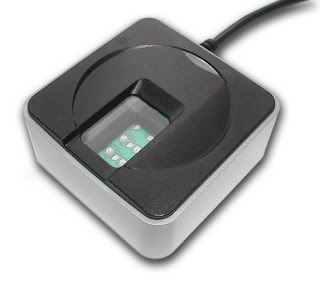 Some engineers at Futronic must have been watching too many spy movies - behold, their latest fingerprint reader, which according to WindowsForDevices is claimed to be "capable of distinguishing live human fingers from dead and fake fingers." Well, so much for making a mold of a dude's finger or chopping it off to get into the bank vault / server room / femme fatale's penthouse. Take a good look and remember what that FS88 looks like; if you're planning a heist and you see that sucker on the door, you're out of luck! 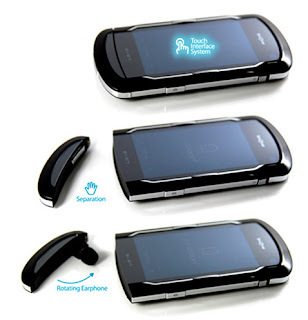 Here's a concept that should have been around about 5 years ago to jump-start the adoption of Bluetooth headsets - a phone with its own headset built to dock right into the phone itself, by designer Sunman Kwon on Yanko Design. It solves the problem of what to do with the easy-to-lose headset when it's not in use; the phone can charge the headset while it's docked, so there are fewer chargers and batteries to deal with; presumably the headset turns on and correctly pairs with the handset (never as easy as it should be) when it's removed; and hey, the whole thing looks pretty decent to boot! I just wonder, if there's a good place to store a headset when they're not using it, will all those yuppies still leave them on their ears as some kind of misguided fashion statement? Probably. Ugh. 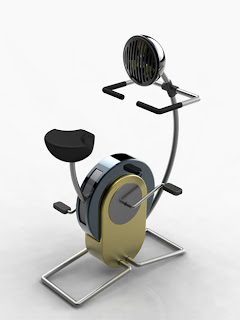 If you'll forgive the horrible pun in the title, this is actually a pretty neat concept - from designer Jin Woo Han on Yanko Design, the Cycool uses an exercise cyclist's own energy to power a cooling fan. Logically, the faster you pedal, the more it cools. Not much more to say, except... cool! Not all good design has to save the world or make a profound difference in how we live. Nope, some good designs just make a good thing a teensy bit better, and the users just an eensy bit happier. For example, when I'm playing a first-person-shooter game on the ol' Xbox 360 with my fiancee and her brother, I need all the help I can get with my aim - and this might be just the thing to keep me from their otherwise inevitable taunts. 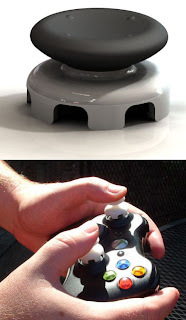 The FPS Freek, from gaming accessories maker KontrolFreek, simply extends the analog joystick on an Xbox 360 controller - and the longer lever arm means that larger movements of your thumb are translated to more refined aiming movements, and smaller unintentional thumb twitches are less of a problem. Sure, the same principle is used in surgical robots to help doctors accomplish tiny, delicate procedures - but me, I'll settle for a better score on my game. Reusing and repurposing old products is an admirable part of Green living, but it can be tough - especially on the eyes. Not many reuse designs look all that great, unless you're the type to sacrifice an attractive home/car/whatever to "make a statement" - and that kind of thinking, by definition, can never go very mainstream. So to make reuse designs truly usable, they have to be attractive - and here's one that makes the cut, if you ask me. 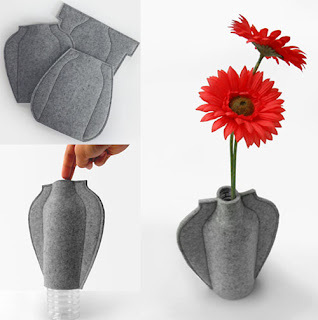 From Orca Design's Greenhouse Effect project, this simple flat pattern of wool felt slips around an used bottled-water bottle and, depending on your personal tastes, makes a pretty darn decent vase. It's not something that any one person could repurpose too many bottles with, but it's a start - and a little kickstart may be just what the whole reuse movement needs. 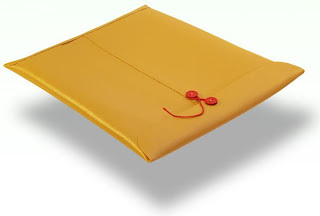 Showing the super-slim Macbook Air laptop fitting into a standard manila envelope has been a great marketing trick, albeit one that we all might already be a bit sick of. Still, now available is a carrying sleeve for the Air designed to look exactly like one of those envelopes - the AirMail, from clever musician-and-journalist couple Jona Bechtolt and Claire L. Evans. So, does it get the job done? It's "padded with thick fleece," which should protect the laptop sufficiently, so yeah. Is it usable? Well, it's hard to imagine a more tedious and annoying way to open and close a laptop sleeve than the spinning-string dealie that this borrows from standard manila envelopes. Ah, but the real question - does it give its owners that hipper-than-thou, check-out-my-hot-new-thing feeling of superiority when they whip it out at Starbucks? You betcha. And all for the low, low price of $29.95. 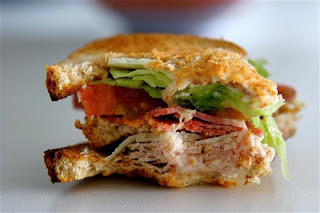 "Every time somebody asked a question, the SVP put something in his mouth. Easy questions got a quick sip of cola while harder questions corresponded to progressively larger bites of his turkey sandwich... This gave him time to formulate an intelligent response to harder questions in a more relaxed manner as opposed to remaining silent for 15 seconds while staring at the ceiling before answering... 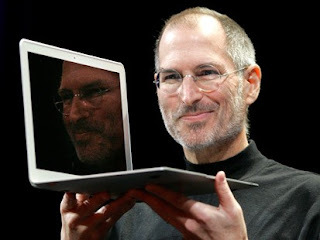 The result was well thought out answers and comfortable feelings..."
As I've said before, good design isn't just for products, it's for experiences, techniques, and as we can see here, even personal interactions. Beginning with identifying the problem (either answering before thinking or leaving an awkward pause before answering) and finding a solution that fits in perfectly with cultural norms (don't talk while you eat!) and context (business meetings with food) - that's just good design! Birds vs. "Toys," Part II: Revenge! Well, after that mean ol' hawk ate that poor boy's toy dragonfly, there had to be some kind of repercussion, right? In Round II of Man('s toys) Versus Beast, Spanish company Bird Raptor Srl gives us the Falco Robot GBRS - that's "Gregarious Bird Removal System." Apparently, (real) birds in the vicinity of airports sometimes collide with planes, which is enough of a danger that live falcons are trained and deployed to keep them scared away. 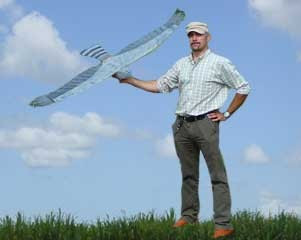 This radio-controlled device is simply a replacement for those live falcons, which looks and acts enough like the real thing to get the job done. And it's true that this has a lot of advantages over live falcons - it's more controllable, less expensive, requires less maintenance, and on and on. The product's web site, in wonderfully non-native English, claims that its imitation of a large predator "arouses immediately in the gregarious birds a reaction of hasty escape." Sounds like Round II goes to Man! 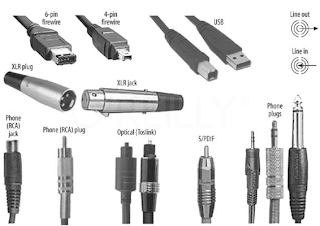 Charlie White of Gizmodo writes an excellent rant on the staggering array of cables, plugs, and jacks that exist to do the same kinds of things - and an impassioned plea for electronics manufacturers to find a way to make One Plug for Everything. He also sketches out some excellent criteria for this uber-cable: "It needs to be small, it needs to have tremendous bandwidth, and it needs to be smart enough to not ruin anything you plug it into." Read the rant, then try not to think about the rats' nest you probably have tangled behind your TV - you'd just get depressed. Most people who own and use bathroom scales probably feel like the poor inanimate object is somehow antagonistic towards them - it tells them things they don't want to hear, and doesn't sugar-coat the message. In hopes of mending this relationship, designer Alice Wang came up with three bathroom scale concepts inspired by Asimov's First Law of Robotics: a robot may do no harm to a human, and in this case, she interprets emotional harm as part of the deal. 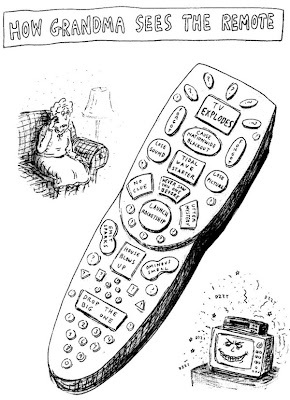 In two of these concepts, the scale enlists a human loved one of the user to do the lying for it. In Half-Truth, seen at left, the user's partner is the only one who can see the actual weight readout, and is responsible for reporting the number (with or without sugarcoating) to the user. In Open Secrets, the scale sends the weight as a text message to the user's partner's cell phone, and again, the partner's job is to report it to the user. In White Lies, it's all the user's call - where the user stands on the scale determines how much weight is shaved off of reality. It's all a little shady, but if small bits of self-delusion can make for a happier population, it may all be worth it. Batteries & Chargers - Time for a new standard? Back in the good (and bad) old days, batteries were standardized: pretty much every consumer device used AA, AAA, C, D, or 9V cells. People could pick up fresh ones anywhere, or even swap cells between devices if they were in a pinch. But then things got fancier - smaller devices, rechargeable batteries of various kinds - and suddenly every device has its own custom cell and its own custom charger. 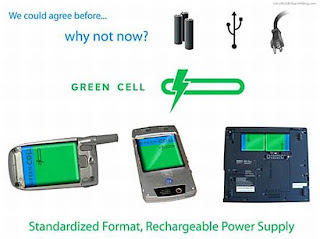 Now, designers Theo Richardson, Charles Brill, and Alex Williams believe we should return to a standardized battery and charger - they call the concept Green Cell, and it was the 3rd-place winner at the Greener Gadgets conference. Their pitch graphic points out that standardization has worked well when it's been accepted elsewhere - the AA battery, USB, and AC plug are excellent examples - and the green implications of a single charger and universally usable (and reusable) are certainly compelling. The likely downside? Since devices won't be able to use custom-sized cells, they won't be able to be quite as slim or sleek - industrial designers will instead have to design around the available standard. But if you ask me, a few millimeters of extra bulk is worth both the convenience and the environmental gain! 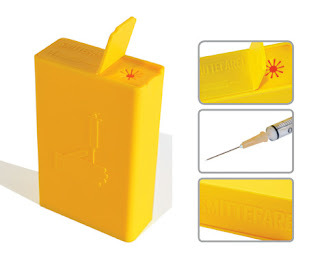 Designer Han Pham intends the lighter-sized Urban Needle Box to be used by drug abusers, especially a certain part of Copenhagen where 90% of abusers are infected by Hepatitis C. It might seem futile at first, or even ironic, to design a product that would appeal to the sensible and responsible side of drug abusers. But, think about it again: just because a person is a drug addict and will continue to abuse drugs doesn't mean he has no conscience, or no concern for the well-being of others. If provided a way to keep his habit as clean and safe as possible - not only for others, but for himself - he'll probably take it. The general goodwill of humanity is there in most people - and a design that allows it to express itself, even during activities that deserve to be discouraged, might just have a chance at working!